If you are the parent of a daughter or son, you may already have some concerns about your child’s well-being. As young men and women progress toward complete independence, some make questionable choices when it comes to health. 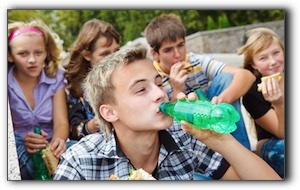 You may know teens that skip meals and others that eat ramen noodles for lunch and dinner. Some youth spend more hours on Instagram than sleeping. Braces can hinder proper brushing. Eating disorders such as bulimia can quickly erode enamel and hurt a smile. Dental issues manifesting in the adolescent years can impact teeth for life. Let’s examine some critical dental issues for adolescents. The third molars usually come in between late adolescence and the mid-twenties. Common wisdom teeth problems include bite misalignment, tooth decay, gum disease, and damage to the nearby teeth. It is essential to monitor wisdom teeth and follow the counsel of your dentist. Parents who notice their adolescent abnormally preoccupied with body image and weight loss should be on the lookout for bulimia and anorexia. These serious disorders should not be ignored. Parents are advised to seek treatment immediately if they discover that their teen is binging and purging or intentionally restricting food. Braces can make proper brushing difficult. Toothbrushes and flossing devices that squirt water can help adolescents with braces clean their teeth and gums. If you visit any Alabama high school during lunch hour, you will see that sugar-laden soda, juice, and energy drinks are becoming a beverage staple. (Perhaps we adults are setting a bad example.) While juice is definitely the healthiest choice of the three, heavy juice consumption can impair enamel just as effectively as a can of Coke. Water is the best drink for teeth as well as calcium-rich milk, which leads us to our next section. Some teenagers who drank milk daily as kids curtail their consumption when they start eating meals away from home. This is unfortunate because calcium is just as indispensable for teenagers as it is for younger children. For strong teeth and bones, encourage your teen to enjoy low-fat dairy products daily. Athletics benefit teenagers in a number of ways but, unfortunately, also pose a threat to teeth. Make sure your teen wears a protective custom mouthguard when participating in any activity where a mouth injury can occur. We encourage parents to be vigilant about twice-yearly dental exams and cleanings for their teens. Many oral troubles occur unnoticed. To schedule a thorough examination and cleaning, call Decatur Smiles at 256-350-5820. Relax. Your Teeth Will Thank You.